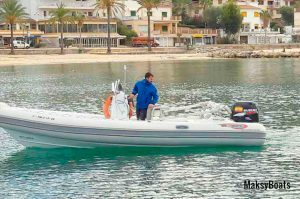 Rigid inflatable boat for hire in Mallorca, with a maximum capacity of 8 people and provided with an outboard 115 HP Suzuki engine. The price does not include fuel. The boat is delivered with full fuel tank. The 115 HP engines fuel consumption is approximately 15 liters / hour, but can vary depending on the number of people aboard and the speed at which you navigate.